U.S. Secretary of State John Kerry met with Azerbaijani President Ilham Aliyev on March 30 to discuss various bilateral and regional issues. During the meeting, Kerry commended President Aliyev on Azerbaijan’s efforts in developing the Southern Gas Corridor, a three-pipeline project which will transport 16 billion cubic meters (bcm) of Azerbaijani natural gas to Europe annually by 2019. The project includes the existing South Caucasus Pipeline built in the 1990s which runs from the terminal in the outskirts of Baku to the Georgia’s Black Sea port of Supsa; Trans-Anatolian Pipeline (also known as TANAP) that runs from Turkish-Georgian border through Anatolia to the Turkish-Greek border, and Trans-Adriatic Pipeline (TAP) which transverses Greece, Albania and the Adriatic Sea and ends in Italy. With a total length of about 3,500 km, it is considered an important step in relieving Europe from single supplier and diversifying its energy imports. Kerry also discussed Azerbaijan’s efforts to become a trade hub and thanked him for Baku’s contributions to NATO mission in Afghanistan, for supporting peacekeeping operations, and contributing efforts in the global war on terror. 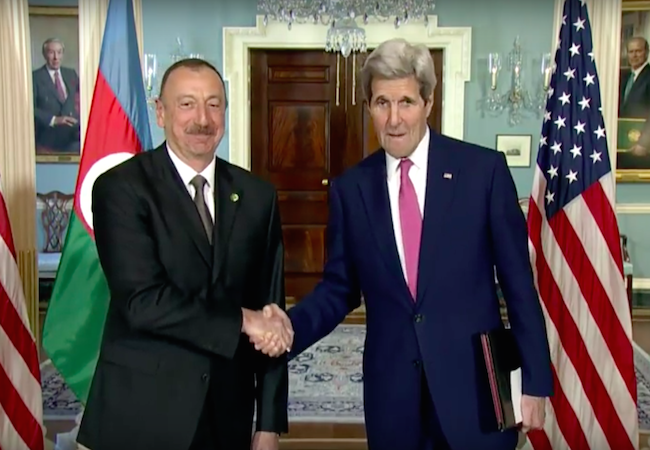 Kerry and Aliyev also discussed the Nagorno-Karabakh conflict between Armenia and Azerbaijan. The war that lasted from 1988 to 1994 left ethnic Armenians in military control of nearly one fifth of Azerbaijan’s territory and produced a refugee crisis in Azerbaijan. OSCE Minsk Group co-chaired by the U.S., Russia and France and tasked to mediate the talks, have so far produced no substantial results. Secretary Kerry affirmed U.S. support for Azerbaijan’s territorial integrity and underscored “our concern about violence along the Line of Contact and the international border.” He stressed Washington’s commitment to working with Armenia and Azerbaijan to reach a comprehensive settlement based on the principles of international law, the UN Charter, and the Helsinki Final Act. President Aliyev is in Washington along with other leaders and representatives of 53 countries for the 2016 Nuclear Security Summit which is being held on March 31 – April 1. If you call wiping out 750 thousand people from their homes, massacring civilians in Khojaly, and creating a criminal statelet run by Sargsyan regime which, by the way, also kills Armenian civilians (see the events in March 2008 when Sargsyan’s army shot 10 peaceful protesters dead in the center of Yerevan), then I have nothing to say to you. You gotta be able to understand that killing others to create a satellite entity whatever the end goal, can’t be endorsed by the international community. With this approach you the Armenians in Karabakh will end up like Tamil Tigers of Sri Lanka or the Serbs of Croatia. Make a deal while you can by agreeing to go back to autonomy – the privilege given to you by Azeris that you never appreciated. Things are coming, sooner or later. Nagorno-Karabakh is independent state with its head of state and parliament. Why the president of Armenia and the president of Nagorno-Karabakh can’t force Washington and UN Security Council on resolution of the conflict by a referendum on whether Nagorno-Karabakh should remain independent state. President Bako Sahakyan should announce referendum and Nagorno-Karabakh people should vote for their choice. Stop, stop the killing. Stop killing Armenian Youth since 1988.